One of my favorite designers Molly Frey Design defines charming with this reading nook with greige walls paint color, built-in daybed, gray pedestal accent table, ivory runner, blue linen throw, natural linen pillows, white curtain window panels and white washed wood framed art. 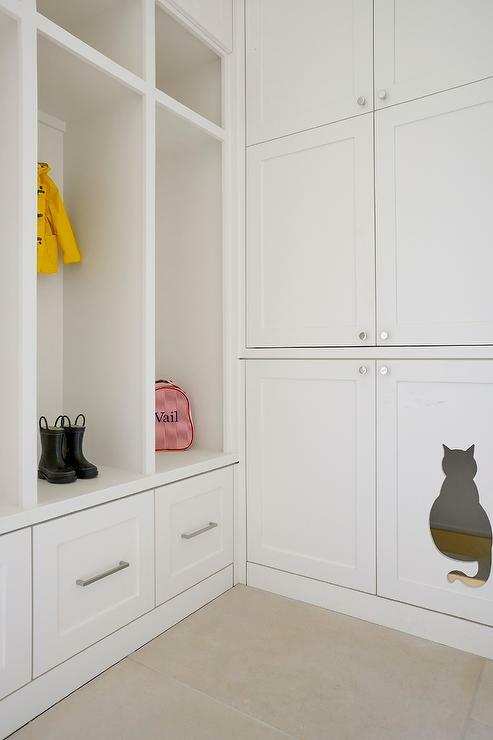 The clever idea that makes this white mudroom finished with wall to ceiling shaker cabinets so charming is a cat shaped cut-out leading to a well concealed litter box. Isn't this fun? You don't need to spend a lot of money on a nightstand. 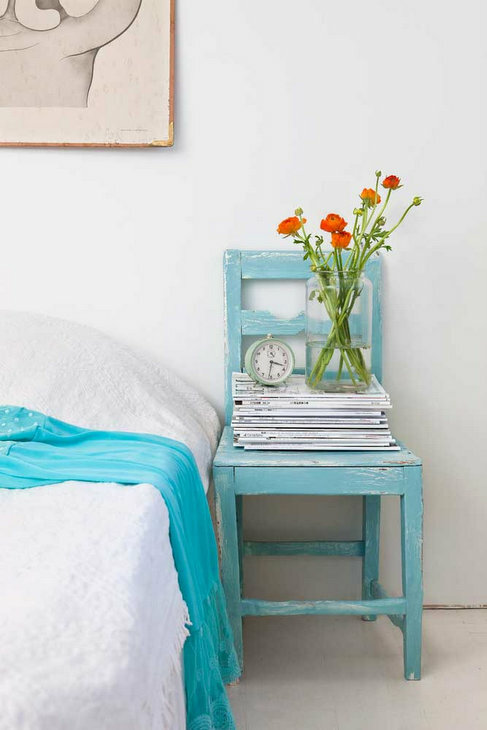 A little elbow grease transforms a vintage chair into a charming nightstand. Or, leave the chair in its natural condition for a more rustic look. 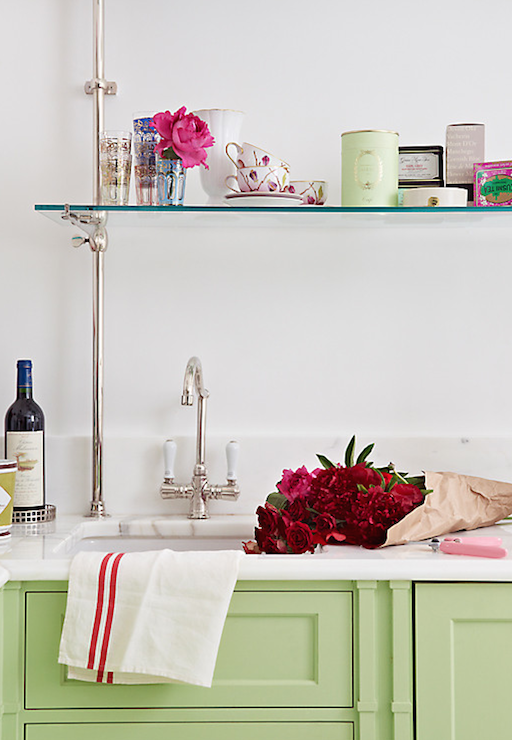 It's easy to add charm to a room inexpensively with vintage pieces. 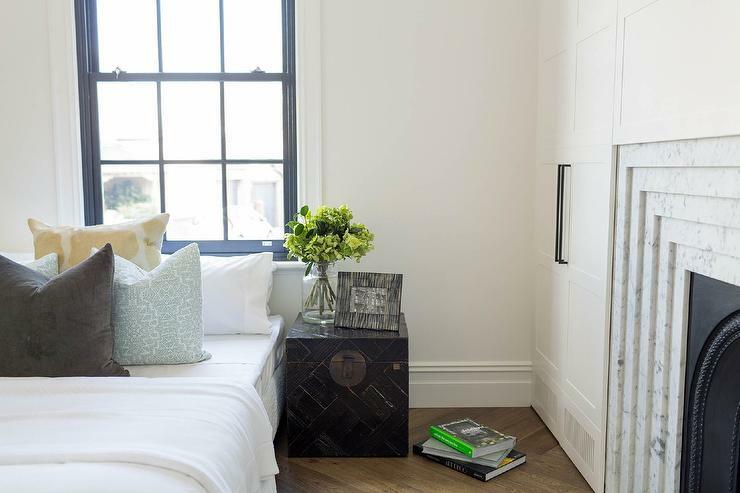 Beside this bed a black vintage trunk serves as a nightstand, while throw pillows add charm to the headboardless bed. 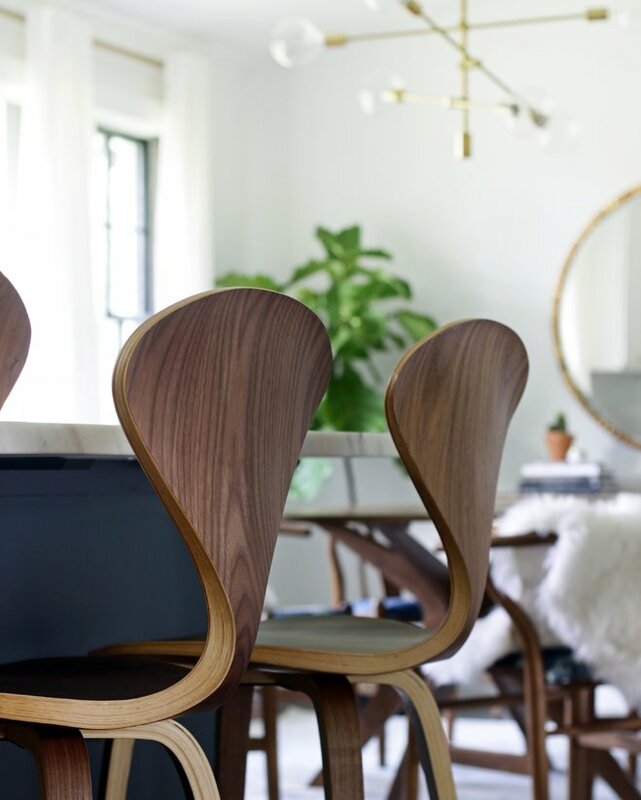 Turn a window seat into a charming breakfast nook with a trestle dining table lined with side chairs. 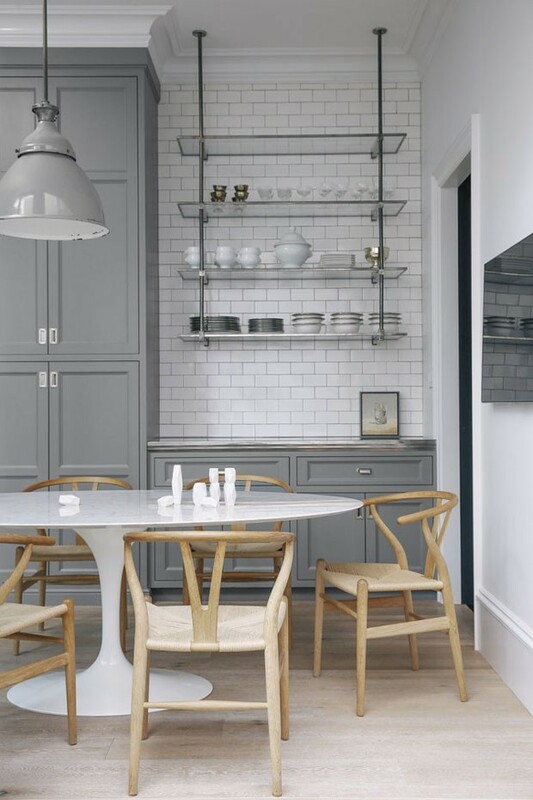 The chairs above are Serena & Lily Riviera Side Chairs in navy. The light fixture is a Sandy Chapman Six Light Square Tube Chandelier. For a unique way to store jewelry these charming stacked wood hand jewelry holders from Alice Lane Home are mounted on the wall. 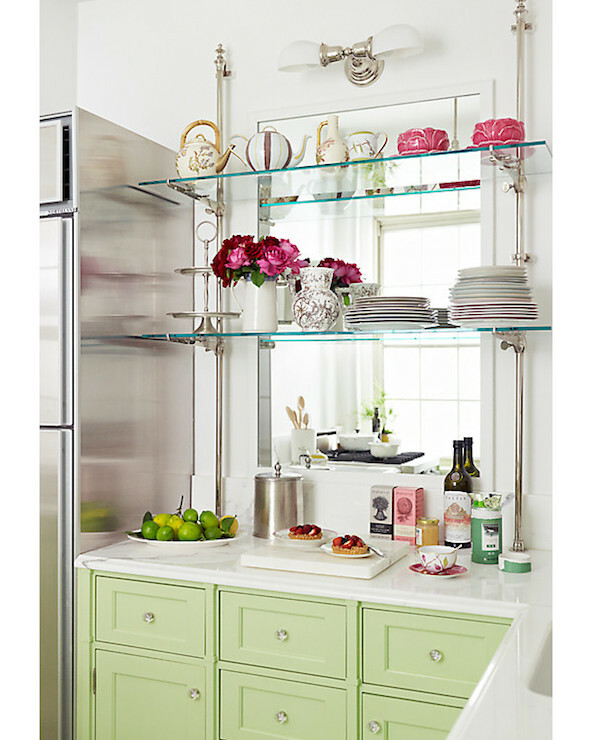 A unique idea for extra storage creates a charming look in this kitchen with stacked glass shelving from One Kings Lane mounted in front of a mirror. Look for other stacked glass shelving ideas HERE.